Thuraya Telecommunications Company announced the world's first satellite smartphone, the Thuraya X5-Touch, at its partner conference in Dubai today, according to a press release. Thuraya is targeting the phone at "users who frequently move in and out of terrestrial coverage," like government and non-profit workers. The press release was light on tech specs, but we know the X5-Touch sports a 5.2-inch 1080p display covered in Gorilla glass and it's IP67 certified. It's got two SIM slots and should be able to switch seamlessly between GSM and satellite service, and comes with the standard trimmings like Bluetooth, Wi-Fi, and NFC. The battery is "high-capacity," and the phone has "a front and rear camera." It's also got advanced navigation hardware and a dedicated SOS button. The X5-Touch runs Android, and although the release didn't specify which version, it's safe to assume it's not Oreo. "The Thuraya X5-Touch is a game-changer and a big step forward in design and functionality, placing it in a league of its own," Thuraya Director of Voice Services Alexander Lachner said. 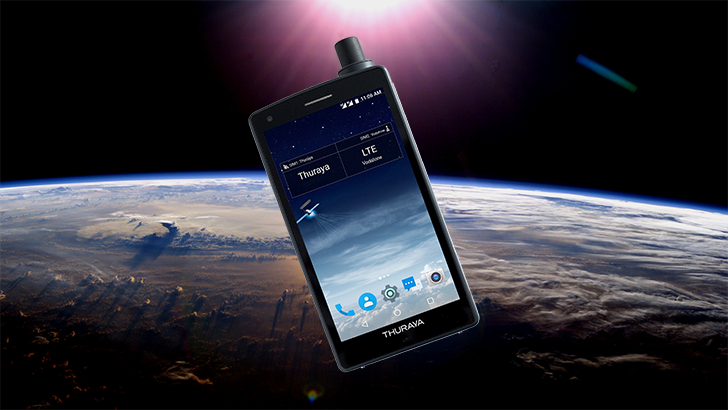 While there have been devices that allow smartphones to use satellite connections—some made by Thuraya—this does seem to be the first smartphone with the functionality built in. The press release didn't mention a release date or price.